Dan Chernenko is a penname of author Dr. Harry Turtledove, a historian who is best known for his alternative history novels. Many of these cross over into the fantasy and science fiction genres by incorporating magic or aliens. Okay, this trilogy is fantasy lite. These books have really good covers, and the blurbs on the back read pretty good, but by the time I was halfway through the first one, I was feeling guilty, and it was the kind of guilt you have for skipping Masterpiece Theatre because you want to watch Desperate Housewives (that has not happened to me, but it was the best analogy I could come up with). 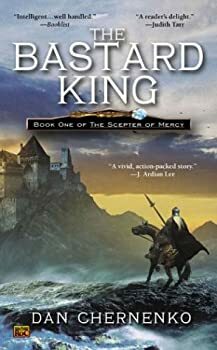 I would note that the cover of The Scepter’s Return bears a striking similarity to Steven Erikson’s Deadhouse Gates’ cover. But, there couldn’t be two more different books.